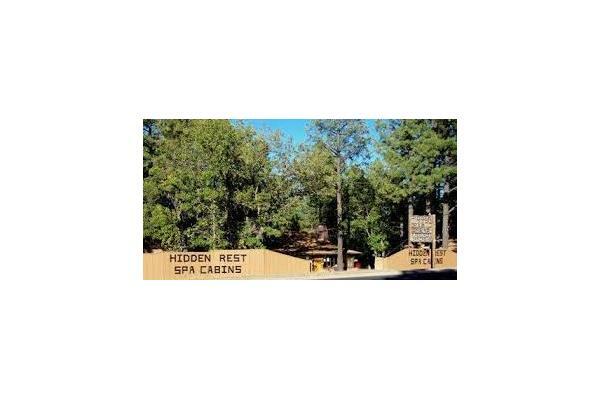 Hidden Rest Cabins are located in the beautiful White Mountains of Arizona. 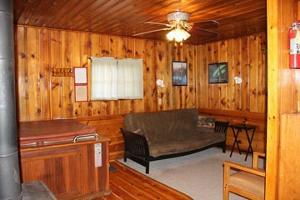 The cabins are located a few miles from Show Low on the way to Pinetop-Lakeside. 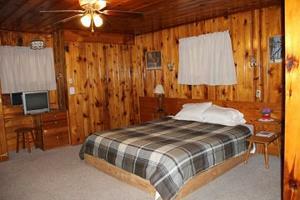 Our goal is to provide you with the best rustic cabin lodging value in the White Mountains. You can choose from cabins that can accommodate a family, or our affordable two person cabins, or one of our trademark, in-room, redwood-decked SPA-CABINS, which are great for a romantic couple's getaway or to soothe aching muscles after a long day of skiing or hiking (these are real Cal-Spas not Jacuzzi tubs). 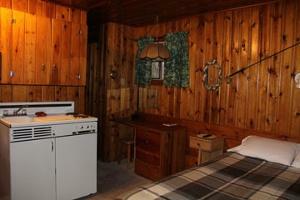 All cabins have cooking facilities, individual bathrooms with showers and in-room cable TV. A limited supply of DVD players are also available with movies for rent locally nearby. 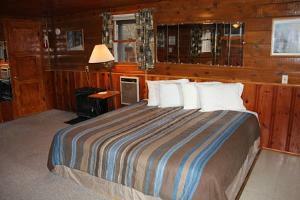 Come see why the Hidden Rest is the best kept secret in the White Mountains! 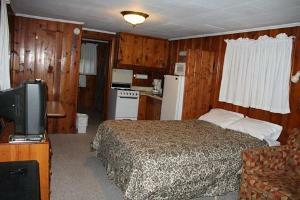 Cozy four person studio with one queen bed and one double hide-a-bed. Two person Spa-cabin™ with a king bed. Duraflame-Log burning fireplace with gold trimmed glass door. 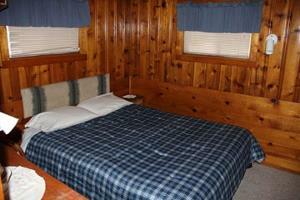 4 person studio with a king bed and double murphy bed. 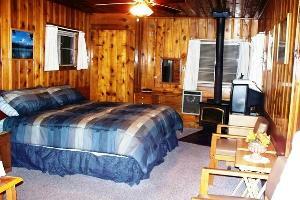 Cozy two person cabin with a queen bed. Kitchenette with utensils, dishes, microwave oven, toaster, 10 cup coffee maker, under counter refrigerator and range (no oven). 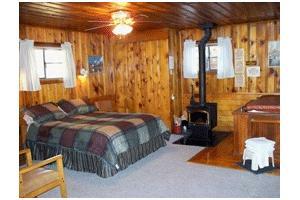 Four person Spa-cabin™ with a two person spa, queen bed in the bedroom and a double futon in the main room. The futon has a comfortable inner spring mattress. Five person Spa-cabin™ with a two person spa, queen bed in the bedroom and a double futon and twin bed in the main room. The futon has a comfortable inner spring mattress. 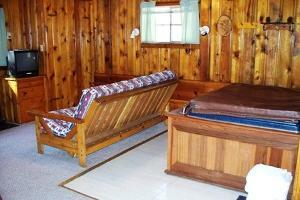 Six person cabin with a queen bed in the bedroom and a queen futon and 2 twin beds (one folds into the wall) in the main room. The futon has a comfortable inner spring mattress. Cancellation Policy: If we are provided at least 15-days notice prior to your arrival date you can receive a full future credit (usable within 1 year), or a full refund minus a 10% cancellation fee. Should you need to cancel a reservation, please email: info@hiddenrest.com. The normal check-in time is between 3:00pm and 7:00pm, although we often accommodate late check-ins. Check-out time is by 11:00am; other times by prior arrangement. It is helpful if we know your approximate arrival time. We will do our best to fulfill any orders for early check-in (no Saturdays) and late check-out (no Fridays). Having a good time is encouraged, but you may not be disruptive to other patrons. Please use common courtesy. Quiet time starts at 10:00pm unless otherwise approved. Small standing BBQ charcoal grill outside of each cabin for use with charcoal only. No exceptions! No outside fires allowed except in the one designated fire pit (unless the fire danger is high and no fires are allowed at all, including charcoal). Rooms that have fireplaces do not include any firewood. Duraflame logs are available for purchase. Only Duraflame or similar type manufactured logs are acceptable for use in indoor fireplaces. Traditional firewood is not allowed. No smoking in the rooms. Whenever smoking outside please use extra precaution as this is a heavily wooded area with lots of tinder on the ground. Please also dispose of all butts properly in an ashtray. A $100 discovery charge will be applied for any smoking inside a room. One vehicle per cabin for parking in front of the room (spaces are marked). Additional vehicles need to park in a shared parking area. Only pets that are well behaved, friendly and supervised are allowed at the lodge. Pets must be leashed when outside due to safety concerns and in accordance with the state's leash law. Pets are not allowed to be left alone in cabins unless crated and only then for a very brief time. Pets must immediately be cleaned up after. For your convenience we have a scoop located near the community area. A discovery fee of $100 per occurrence will be added for any undisclosed people or pets. Any firearms must be disclosed to the office manager upon arrival. Additionally, paintball and BB guns are not allowed for use on the property. No cleaning of fish inside the rooms. For your convenience we have an outside fish cleaning sink. All rooms receive a post-occupancy inspection and by booking a reservation you acknowledge responsibility for any damages or theft incurred during your stay, which will be charged to your credit card. This is a rustic environment. As such, it is your responsibility to take care of yourself and your dependants. We are not liable for any accidents, injuries or loss of any kind. Thank you very much for your patronage and we look forward to your arrival!